King Jeremiah is a Dark Spirit who invades you in the Painted World of Ariamis. He is the legendary exile, and no one knows where he came from. He wears a far too big crown, along with bright yellow clothes. In the courtyard down the stairs to the right of the Phalanx group (coming from the bonfire); the area with crows, impaled corpses, and iron boxes. Black Phantoms will only spawn if the player is in human form and the area boss has not been defeated. This means that defeating a boss before being invaded by a particular NPC Black Phantom will forever deny that Black Phantom from appearing in that area on the current playthrough. The area boss for King Jeremiah is Crossbreed Priscilla. If Jeremiah falls off a ledge, once the loot appears, just quit and reload your game and the loot will be where Jeremiah was last standing before falling off. Once defeated, his corpse (containing Xanthous Set) can be found on the broken down bridge behind Crossbreed Priscilla. If you have killed Jeremiah and the armor is not there, you can try to quit and reload your game. You will be placed outside the boss room when this happens, but the armor should appear on the bridge. 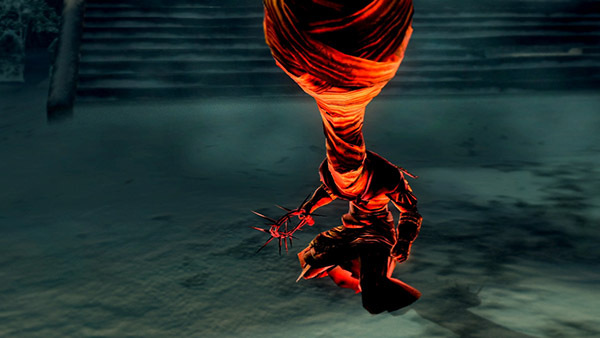 His headgear is a reference to the Monk's Head Collar from Demon's Souls. Jeremiah's title, "Xanthous King," could be a reference to Hastur, known as the King in Yellow in certain stories. The word Xanthous means "yellow," and his equipment's colouration matches his title. Notched Whip attacks - His special weapon. Bypasses shields and has bleed buildup on hit. Chaos Pyromancies - Be careful of the lava it leaves on the surface. Jeremiah seems to have high MagAdjust on his Pyromancy Flame, since his pyromancies deal very high damage. His magic defense is incredibly high, so prepare to bring a weapon with a different damage type if necessary. 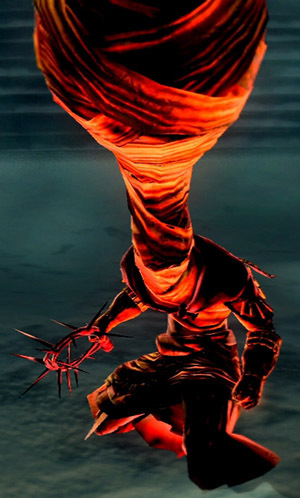 It is recommended you engage him away from the cliff, as he can fall to his death and you will therefore not receive the Notched Whip and Humanity.